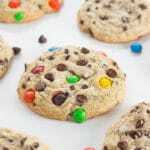 These are tried and true family-favorite chocolate-chip cookies with two secret ingredients, no wonder they are the best! These cookies are crisp on the outside and soft/chewy in the center. So you may be thinking this is juuust another chocolate-chip cookie recipe. That’s where I’m going to tell you, it’s not. Well, I guess it is. But this isn’t “just another one” — it’s the best. And with two “secret” ingredients you don’t typically see in a chocolate-chip cookie recipe that totally makes these the best. In all the time I’ve been blogging, I’ve never posted a chocolate-chip cookie recipe because I have yet to perfect one. However, I’ve been working on one as long as I’ve been blogging and I couldn’t be more thrilled with the results of this recipe. First – oat flour. But don’t be scared off by that in your cookies. 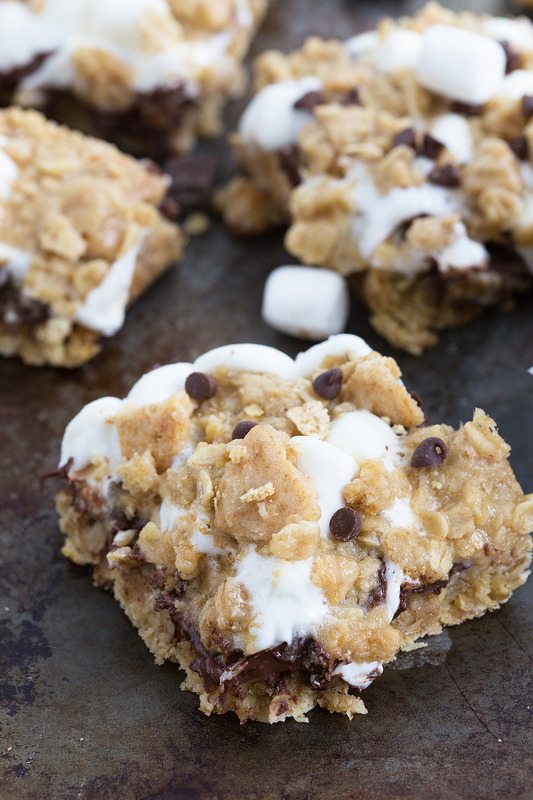 Oats add a texture and a moistness to these cookies that can’t be replicated. And you know how good oatmeal chocolate chip cookies are? That’s why I thought oats were a must in a perfect chocolate-chip cookie recipe. You don’t need to specially buy oat flour for this recipe. If you have old-fashioned or quick oats, all you need to do is quickly blend them in a blender, food processor, or a magic bullet until they resemble flour. The one important note with oat flour and this recipe is to make sure you measure the oat flour AFTER grinding the oats down to a flour and not before. Okay, next secret ingredient is cream of tartar. Weird in cookies right? I actually learned this ingredient and trick at a restaurant I used to work at. The restaurant baker (that made all of the delicious desserts and huge bakery-style cookies (that sold like crazy!)) and I became great friends over the six and a half years I worked there. I would sometimes come in early on a Saturday morning or go down to the kitchen section when we were slow just to pick his brain about baking and cooking. He was a master and developed a lot of his own recipes that were “famous” at our restaurant. One of our discussions were cookies. He always put some cream of tartar in the cookies. He said just a little went a long way with the consistency of the cookies. It also keeps large cookies from puffing up way too much so they stay an even size even when they are large. The cream of tartar also contributes slightly to the flavor and largely to the chewiness of the cookies. Cool ingredients right? I’m just hoping you make these so you know how AWESOME they taste!! P.S. The picture above? That was before M&M’s which you can add or leave out – whatever you want! But before we get to the recipe (if you are reading this novel of a post! ), here are a few more tips to ensure your cookies work out the best. First off, everyone measures flour differently. Make sure to spoon and level instead of packing the flour in. A really helpful tip though is to keep adding in flour until the dough pulls away from the bowl or allows you to place a ball of dough on a tray without most of the dough just sticking to your hands. Don’t be scared to add in extra flour if the dough isn’t pulling away or is exceptionally sticky. Add it slowly until the consistency is like I described. Another note with the flour is the puffier and cakier you want these cookies, the more flour you add. If you want them to spread more and to be more crisp, add less flour (even than indicated in the recipe). You can always test 1-2 cookies with less flour and see if you like their consistency after being baked. If not, add a little more flour and test again. It’s worth this testing process to get the very best (and your personal preference) cookie! For the butter – do NOT melt the butter. If you do, your cookies will run or you will need to chill the dough for at least 1-2 hours. Make sure it is a room temperature by leaving it out an hour in advance to baking. There are a few shortcuts to softening butter, but microwaving or melting isn’t a good idea. If you want, you can chop your butter into small cubes and it will soften quicker. The eggs should also be at room temperature. Check out this post to bring eggs and butter quickly to room temperature. Using quality ingredients is also super important to making the best every cookies. Good butter (not margarine), real vanilla extract, and high quality chocolate-chips (I recommend guittard or ghirardelli) will make these cookies perfect! To keep all of your cookies the same size, measure the dough into a 1/4 of a cup measuring cup and then dump the dough onto a baking sheet. Final tip is just on appearance. 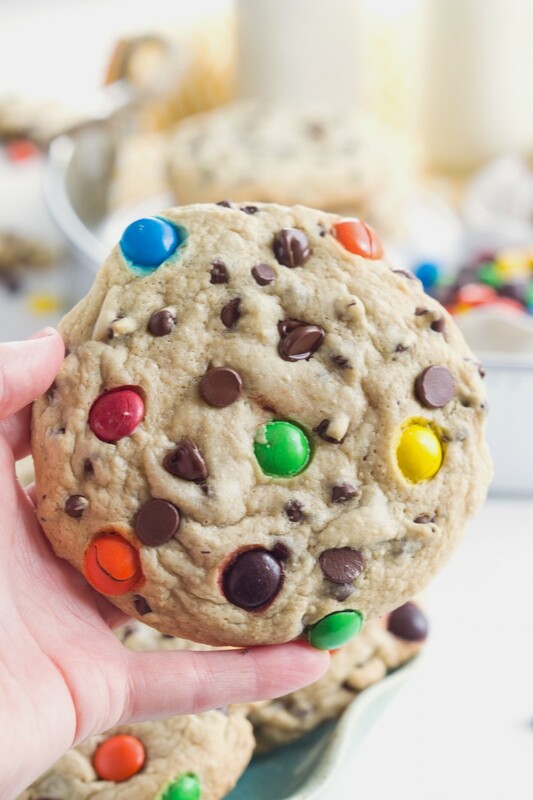 To get the pretty look of chocolate chips and M&M’s on top of your cookies, place them strategically on your balls of dough right before going into the oven. It may sound silly, but it will make your cookies look gorgeous and even that much more appealing. In a large bowl, beat together the butter, brown sugar, and white sugar until light and creamy. Separate the eggs. Beat the egg yolks into the sugar and butter mixture. Discard or save one of the egg whites for another recipe and place the remaining egg white in another bowl. Add the cream of tartar in with the egg white and beat for several minutes. Beat the vanilla extract and then the egg white mixture into the bowl with the butter, sugar, and egg yolks. In another bowl, mix together the salt, baking soda, flour, and oat flour (Measure the oat flour AFTER grinding and not before). Stir until combined. Combine the dry and wet ingredients and stir until just combined. Stir in the regular chocolate chips, and the miniature chocolate chips or chocolate chunks. Using high quality chocolate chips makes these cookies the BEST! I recommend guittard or ghirardelli. 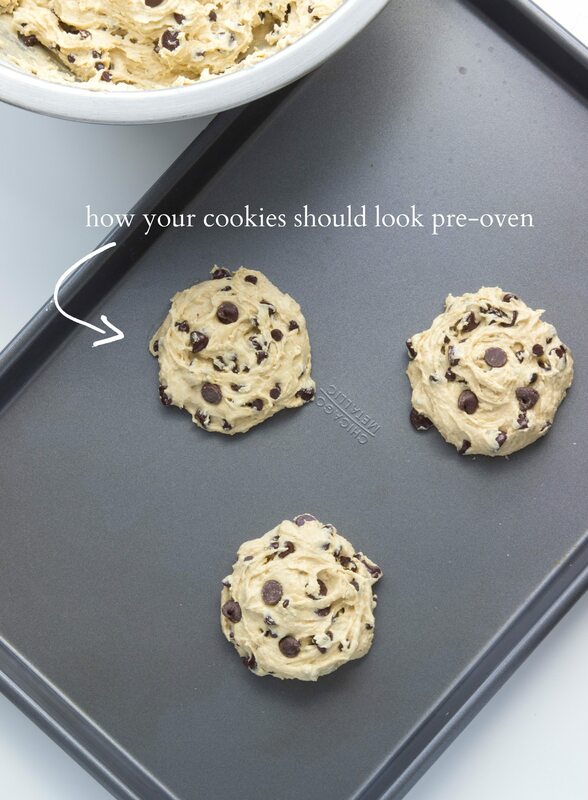 Use a 1/4 cup measuring cup to measure out the dough onto a cookie sheet. Strategically place extra chocolate-chips and the M&M's on the tops of the cookies. 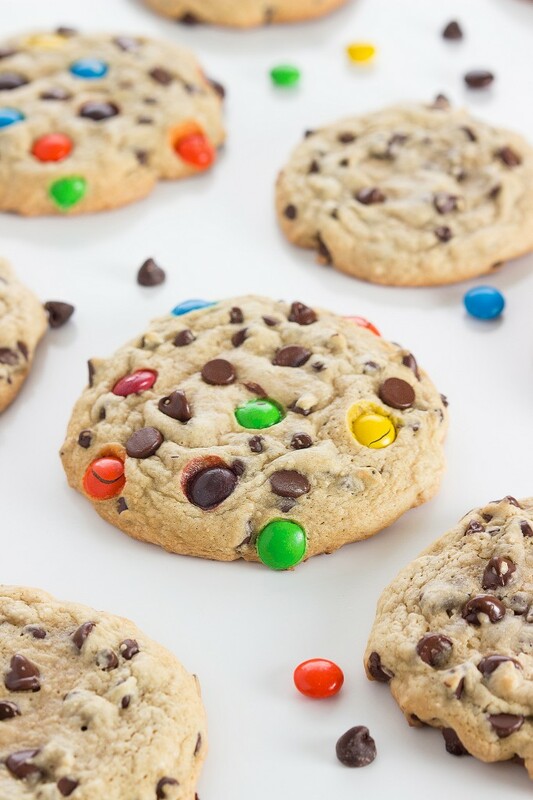 (I don't mix the M&M's into the dough, but rather place them on the tops to get a pretty bakery-style appearance). Cook for 10-12 minutes or until the sides are lightly browned. Remove and allow to "cook" more on the cookie sheet for about 4-5 minutes before transferring to a cooling rack. Under-baking your cookies is key to soft and chewy cookies. These cookies have a very soft and chewy center with crisp edges if baked appropriately. *Often times cookies are messed up because people measure flour so differently. If you have a kitchen scale, the best results will come from measuring your flour - otherwise spoon and level or you will likely have way too much flour (by scooping into a flour bag it packs in more flour than is needed). **I have lots of trouble-shooting and helpful notes throughout this post. I highly recommend reading the tips before making these cookies for optimal results. So sorry Rae! I wasn’t able to post the party since I was in a cabin without good internet reception for a week! It will be back on this Saturday! Oh Chelsea these look so great! I used to be a baker by trade and I approve of these tremendously!! Love the oat flour, it definitely creates a welcome chewiness. These are beautful cookies! Mmmm! Definitely trying these Chelsea. I’m not innately good at baking like I am cooking, so I’m always looking for other tried and true baking recipes — especially cookies since that’s my husband’s favorite. Can’t wait to try them! Yum! These look so good. Pinned! 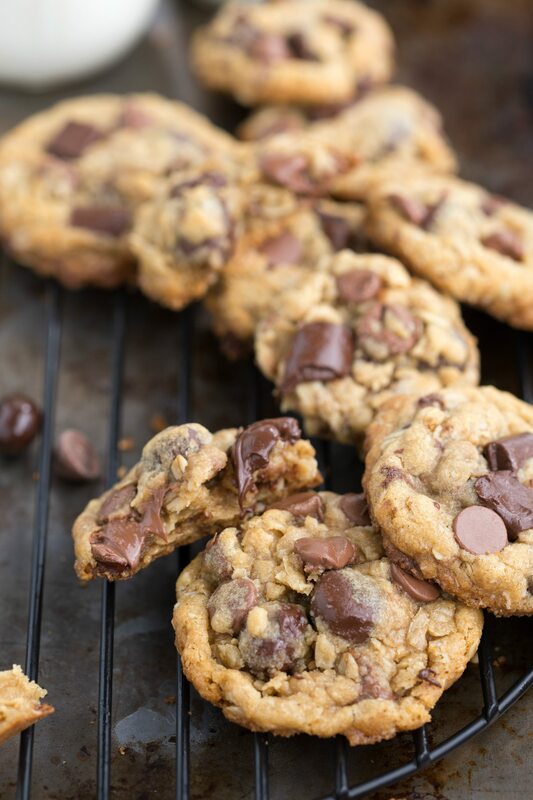 There can never be toooo many chocolate chip cookie recipes in my book! These look fanastic! Sometimes the most classic desserts are the hardest recipes to perfect. I went through a big stage of chocolate chip cookie recipe testing last month and it took me dozens of recipes to actually find the perfect one. I’m so going to give yours a spin sometime this week! I’ve used oat flour in cookies before and the texture is just to die for. Never thought of cream of tartar, though! Thanks for all of the bakers notes, too. FANTASTIC looking cookies! My mom uses cream of tartar in her CCC cookies and I use cornstarch and neither one of us use oat flour. Maybe this was the missing link to taking our good cookies to great cookies. I can’t wait to give them a try! Wow! Lots of great tips in this post – Chelsea! That’s great! I love how perfect your cookies look BEFORE they go into the oven – and then they turn out to be the most beautiful cookie ever! With great taste and perfect appearance, what is not to love? 🙂 Pinned! You totally have succeeded in making these the best! I love oat flour in cookies too and the cream of tartar is a new one for me-I’ll def. have to try it! hooray for big, delicious, cookies! These cookies look absolutely perfect, Chelsea! I’m not that great at making cookies, so I’ll definitely have to try your recipe! Especially the cream of tartar. So cool you got the chef to tell you his secrets. 🙂 Pinning! Okay you got me. These really are different. I bake a LOT of cookies. Of course a lot of those are chocolate chip—my recipe and others. But this one is different. I am going to have to try it! These are some serious cookies!! I love your cookie science too. Oat flour- great idea! Just tried this and BEST COOKIE RECIPE EVER. I will never try another! My whole family ate them right up! Thank you for the helpful tips as I’ve often had cookies go flat and spread a lot. Cream of tarter? Love it! I’m always looking for new tricks to add to my cookie baking repertoire. Thank you for sharing. These look DELICIOUS! Whoa lady, these cookies look amazing! Love all these tricks and tips too 🙂 That’s awesome that the restaurant baker told you his secrets – they sound perfect! Pinning! Such delicious looking cookies! Love how big they are! I’m going to have to try that cream of tartar trick and the oat flour! Love these cookies, Chelsea! I’ve never baked with oat flour, but I definitely have to change that. And I always add cream of tartar into my snickerdoodle cookies, but have never thought to do that with any others. Love this recipe! Pinned! Choc. 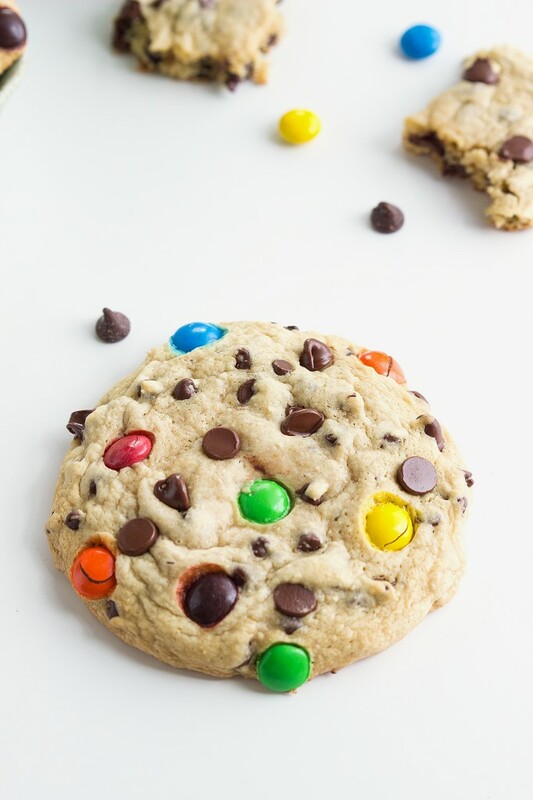 Chip M&M cookies are my favorite! these look incredible! and the pictures are beautiful 😉 Pinned! i need to eat these! What a beautiful looking cooking! I love the oat flour idea! A restaurant baker seems like a pretty great friend to have!! These cookies look perfect. Definitely going to try your secret ingredients!! Oh my heck. I was a little skeptical on these being the best ever, but these are seriously the BEST EVER. I have tried hundreds of cookie recipes and never found the perfect recipe until this one. I followed all of your notes and these were perfect. I can’t believe the texture. Thanks for a wonderful recipe and one I will use forever! Oh my heck. I was a little skeptical on these being the best ever, but these are seriously the best. I have tried hundreds of cookie recipes and never found the perfect recipe until this one. I followed all of your notes and these were perfect. I can’t believe the texture. Thanks for a wonderful recipe and one I will use forever! I am dying for one of these right now!! I can tell this recipe truly is the best and cannot wait to try it this weekend! Hey! 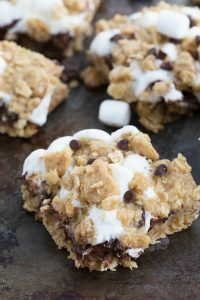 I made these this weekend and they are super good! Thanks so much for the recipe- this will go in the binder of recipes to keep and share with friends. Thank you! 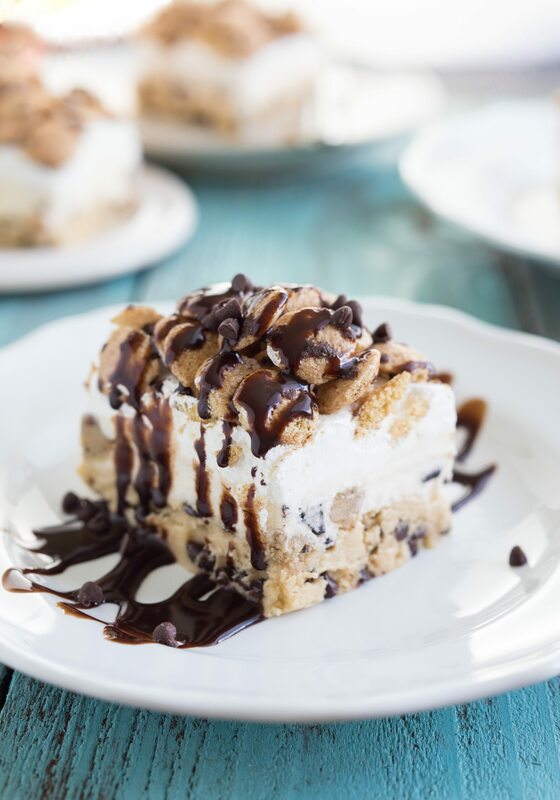 Can you describe the texture of this cookie? I was wondering if they’re soft and puffy, or if they get a crisp and chewy texture? Thanks so much! I must say that your recipes (and, more importantly, PHOTOS) all look simply amazing. I was just wondering if you have nutritional facts posted anywhere? Did I just happen to miss them? Thanks Eden! I typically don’t do nutrition facts for my recipes. If you have a question about a specific recipe, I can get you the stats for them. Thanks! I put all the different measurements because people measure their flour so differently. The 2 and 1/3 cups for me was about 368 grams when put on my food scale. Did the cookies not work out for you? But i dont think it should be such a big diff? i removed 60g of flour mixture before i added in. May i know did u flatten the cook dough? because it is not too obvious from the top view picture. mine came out quite puffy without flattening, but still good though. Just not too sure for now, i should actually be using 300g flour or 360g, Its such a huge diff! Does it matter whether you use salted or unsalted butter? These were really good. Loved the flavor and how many chocolate chips in the cookies. Definitely make again! My favorite cookies ever! These were very good and easy to make. I just pinned these and loved reading the post – oat flour, cream of T, the whole post was spot-on perfect and full of great info! And I would kill for one of these right now!! We like our cookies less cake-like so left out some of the flour like suggested and these were wonderful. Great texture, kids and wife loved them. Great recipe, thanks! These really are amazing! I’ve always wanted to make huge cookies! All of my friends and family loved these cookies too. They really are the best! Thank you for sharing! Yay!! So glad to hear you loved these!! Thanks so much for you comment and for trying these cookies Erin! How much cornstarch? I do not see the amount listed in the recipe. Thanks! Quick question…the pic of ingredients shows cornstarch, cream of tartar, baking powder & baking soda. But i don’t see baking powder listed in the actual directions or an amount. Do i need it? Ooo love the idea to use Reese’s Pieces!! So glad you love these cookies 🙂 Thanks Celeste!! My favorite recipe for snickerdoodles uses cream of tartar. It is the ingredient that supposedly keeps them soft. Hi, delicious cookies!! I made them last night :-). But I have a question. Why do you separate the eggs and beat the white + cream of tartar (c of t) into a foam? I know c of t is often used to stabilize egg white foams but in those recipes you then carefully fold the whites in as the last step to avoid deflating the foam. In this recipe the foam is beat into the liquid, then mixed again when the dry ingredients are added, and a third time as the chocolate is incorporated. It seems like there isn’t a chance any of the foam would survive. I also checked out snickerdoodle recipes which include c of t and noticed it’s just mixed in with the dry ingredients. Anyhow, I guess all this is a lot to say, the cookie were delicious, but it seems like one could save 5-10min separating and beating the eggs, so I was curious if you know the reason it’s done this way in this recipe. I’m really surprised to see that you are not using parchment paper or a silicon baking mat on your cookie sheet. That is what makes baked goods really good- no brown bottoms, no scraping them off the sheet, and uniform in size on the bottoms. You can definitely use one if you’d like. I actually have never had any of the aforementioned issues by using a really high quality baking sheet. I use Chicago Metallic or Calphalon and love the way my cookies turn out on them! I baked a double batch of these cookies for our July 4th holiday family fish fry, and they were a big hit! I’ve been searching a long time for the perfect chocolate chip cookie recipe, and I finally found it – thanks to you! Chewy and full of chocolatey flavor, they were both beautiful, wonderfully aromatic, and super tasty. Your “secret” ingredients were definitely the key! I was wondering what kind of scoop you use for these? Hi, to what stage should the egg whites be beaten (soft peaks, foamy, stiff peaks, etc)? Hello! I’m excited to try this recipe out – I’ve purchased the ingredients and will be making this tomorrow. I just have one question: do these cookies spread out, and if so, by how much? I’m not sure how big to make them on the baking tray – I’ll be using a 1/4 cup scoop, but I’ll be shaping them into circles with my hands. Approximately how large should each cookie be when placed on the baking tray? Awesome! Followed all your directions as posted and they are delish! Funny how I thought I was taking them out to early but they set up so nice on the pans after letting them sit for 5 minutes before removing to cooling rack. I just made these and they turned out great! They do take a little bit longer to make vs. regular CC cookies but it is worth it! Next time i will make a double batch so they last a little longer! Love the recipe! Thanks so much for sharing. Awesome! SO glad to hear you enjoyed these! Thanks for the comment Kara! Is this recipe not supose to have brown sugar? Thank you! About how big do these cookies get? (Diameter in Inches). Need to make ‘big bakery style cookies’ and I’ve had so much waste with all the other recipes I’ve tried (didn’t spread enough). Also, can I refrigerate the dough overnight and bake the next day? Yummy, yummy, yummy! Recipe definitely a keeper! Thanks for sharing. All my cookies (oatmeal, peanut butter, gingersnaps) turn out great except for my choc chip. They usually spread too much and taste egg-y. These turned out wonderful. I agree with a previous comment that they are a little more work but they are worth it – mine turned out thick and chewy! Pinning now! Yay! So, so great to hear these were a success for you and well enjoyed! I’m so happy to hear that! Thank you Nancy! You mentioned using a scale would produce better results do you know how many grams of flour to use? I’m not much of a baker. My dough turned out crumbly. Did I do something wrong? Thanks! If you dough was crumbly you likely over-measured your flour. Did you scoop and level it? By pushing a measuring cup into a bag or container of flour you are packing in a lot more than needed. I hope that helps! Just made these……so so good! Did you flatten your cookies some? They look like it in the picture that shows what they should look like pre-oven. About how many of the cookies fit on a cookie sheet? No more than 6 on an extra large cookie sheet! Can these be frozen? They look divine! I’ve never tried freezing these, but I don’t see why they couldn’t be! I’ve tried putting half the batch in the freezer to deter my desire to eat them all immediately. Doesn’t work. They’re absolutely delicious, even straight out of the freezer. This is my #1 cookie recipe! These look fantastic – but wonder can I make them smaller than 1/4 cup? If so, how long would you bake for? Thank you so much for sharing! I’ve been looking for the perfect bakery style cookie and finally came across your fabulous recipe. They came out perfectly. Thank you so, so much! What if I want to leave out the 1/2 cup of chocolate chunks and the M & M’s . Do I use 2 1/2 cups of chocolate chips to make up for the amount or just use 1 1/2 cups of chocolate chips ? Otherwise does the amount of extra stuff affect the consistency or thickness of the dough?? Amazing cookies… Looks divine too definitely will try. One doubt if I want to reduce the egg to one so I hve to reduce the quantity in each ingredient rite. So,, 3/4″half I hve to put”how can half. If you half part of the recipe you’ll want to halve it all. So half of 3/4 cup is 1/4 cup + 2 tablespoons (6 tablespoons). Enjoy these! Hi! These look great! Can’t Wait to try them out! How do you achieve the pre-oven look? It seems almost swirly, not like a flattened ball… thanks! Love these cookies! Quick question (although I realize this is an olderish post! )….does it matter if it’s dark brown sugar or light brown sugar? I’ve made them before and they were perfect, however, I made them this weekend and they are crunchy. I can’t remember which I used and am wondering if you have a preference. Thanks! I use light brown sugar 🙂 If they were crunchy they could have been a bit overbaked or perhaps the flour was over-measured a bit. Hope that helps! Can i refrigerate the dough over night and bake it the next day? Can you make these into peanut butter cookies by just omitting the chocolate chips? I am going to make these tonight and we are going to have them on Mother’s Day!! The base won’t be peanut butter flavored; I’d recommend these peanut butter cookies: https://www.chelseasmessyapron.com/peanut-butter-cookies/ and you can add M&Ms to those too! Thank you very much! OMG! this is THE recipe, these are the best cookies by far I have ever tasted! Wow just made these wish I could show a photo of them. Very good recjpe ! !